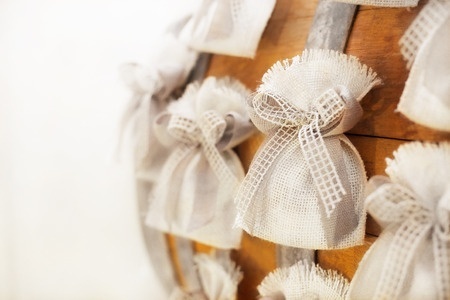 Are you looking for a wedding favor idea that will wow your guests, but not break the bank? Here are 5 fun, creative (and easy!) wedding favor ideas that your guests are sure to love! Coffee is a great wedding party favor idea that is low budget. Use the cute phrase “Love is brewing” or “The Perfect Blend” and include your names and wedding date. See if there is a way to add a coffee station at your wedding reception where guests can brew their coffee that night! Rescue your family and friends from bad breath after dinner with these adorable “Mint To Be” mints! Customize them with your names and wedding date for an even more personalized touch! Koosies are an awesome wedding favor idea; especially if you are serving cans at your wedding, They can use them that night to keep their drink nice and cold! What’s great is they are something that guests can keep and use for years to come! Matches are a classic and affordable wedding party favor. They are something that your guests can keep in their pocket or purse. Super practical! Give guests flower seeds as a party favor and watch your love grow (literally)! Guests can plant the seeds and every time they see those flowers, they will think of you, your wedding day and the love that continues to grow.